This entry was posted in Editorial and tagged Opinion, Pictures, Roleplaying Game, RPG. Bookmark the permalink. Apparently, you don’t believe rules affect play. It seems to be your conceit that if two systems allow all the same actions, they have the same role-play potential. As you say, “role-playing lives in the fluff, not the crunch”. So, if I used the same fluff with two different systems that allow the same actions, they would result in the same character interactions. Now, let me give you a concrete example: minions. They are disposable goons used in volume; they are faceless if for no other reason than there are too many to name and they die too quickly to have characterization. By your reasoning, adding them to the game or not will not affect how the game is played yet this is not true. Making your enemies faceless makes you an easy serial killer, leaving heaps of bodies behind you. If every enemy has a name, face and serious chance to be around for more than a few seconds you will react differently. Now you can have plot in a group of henchmen playing poker in a guard shack. These aren’t goon 1, 2 and 3, they are Bob, Steve and Joe. Bob was just thinking about dating Joe’s sister. Maybe they are still killed out of hand, but the realistic option exists for them to be more without bending rules. That is role-playing, becoming immersed in a world where you treat people more like people. If the game encourages you to become a sociopath it is not encouraging you role-play various characters. The more the game encourages a single path to victory, especially combat, the less role-play it will have. I know you will be stuck on my first example of minions, so let me give you another: virtues. White Wolf and others have a game mechanic that tracks choices you make. The more you kill innocents, or kill in general, the less human you become. This has real consequences such as resisting temptation to kill some jerk when it would be a bad idea or how long you must sleep. Again, two characters from different games with the same fluff and same abilities, which is going to consider his actions more? Which is going to help you “understand a differing point of view or social interaction”? To say rules don’t affect points of view or social interaction is demonstrably false. Fluff may tell you to name your minions but fluff doesn’t have any rules behind it. Fluff is called fluff because it is very soft and easily pushed away. Rule make the game and the game makes or breaks role-playing. I think you may have misunderstood me. I didn’t say that rule systems don’t effect role-playing, I just said that they don’t enhance it, they serve as limitations by limiting what you can and can’t do, as opposed to free-form role-playing. I would point out that minions, or disposable enemies, are a play style choice more than a mechanical thing. 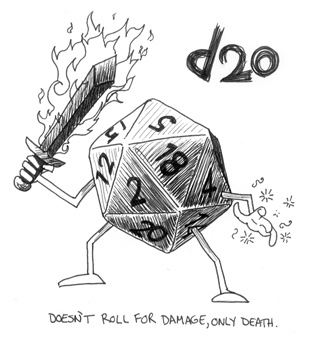 The concept of the minion monster has been in D&D since the first boxed set. The game mechanic of the minion came about 30+ years later to simplify the execution of this archetype. If the minion type monster hadn’t been made there would still be monsters of that same style, they just would be a bit more taxing to DM. I’m also familiar with the humanity points system used in games like V:TM. I actually rather like the system. Having that definite reminder in a game to force players to stick to their role, rather than ignoring it when it suits them, can be useful. But that’s still a restriction compared to free-form. I think it’s a restriction that works very well for the game’s setting, but it still is a limitation, not an enhancement. Ok, so more clearly you think game rules will not improve role-play only impede by what you can and can’t do. That means if rules cover something other than what I can and can’t do, they should have no affect on role-play. Minions and humanity ratings don’t affect what you can do therefore by your own view they shouldn’t affect role-play but clearly they can so your assertion must be incorrect. You mention free-form RPGs as having the most role-play. Again, follow the thought: no rule can encourage you to get into character, the essence of role-play. Yet, you mention all the problems with free-form: All it takes is one guy not in sync to knock down the house of cards. If that would be a problem and rules would prevent the problem then rules must encourage role-playing. More than this, rules give a concrete existence to the world where I’m trying put my point of view. If I didn’t know what an orc was I would understand them after I saw what they could accomplish in distinct terms, such as relative to what I can do. Experience in terms of actual effect rather than description is better for a understanding a point of view. That is why role-playing involves going through the motions of character rather then just hearing about them. It’s easier to build on concrete over sand even if the sand could be any shape. Your observations on role-playing are good but your conclusions don’t follow. If rules fix a problem that stops role-playing how can rules only limit role-playing? Not really. I wouldn’t say the rules have no benefit. There are benefits, otherwise no one would make that trade-off. But it’s not enhancing the role-playing so much as it is policing player behavior. I think it takes a little more experience to go sans rules and police yourself, rather than having the rule system do it for you. So by your example there, a Trolloc in the Wheel of Time book series is less real than a Trolloc in the d20 Wheel of Time RPG, because the Trolloc in the d20 rpg has stats and the Trolloc in the book series is just described? Sorry, but I just don’t see it. In your example with the orc it’s the DM’s job to portray the orc to you. If you’re not being given the information as to what an orc is and what it can do relative to you descriptively and you have to rely on his game mechanics to give you that information, that’s not good role-playing. Everything you’ve stated as a reason why the rules of an orc are beneficial are all things that can be relayed by talking, rather than the rule set. Not that I don’t understand the comfort in having some concrete numbers, but they’re not required.